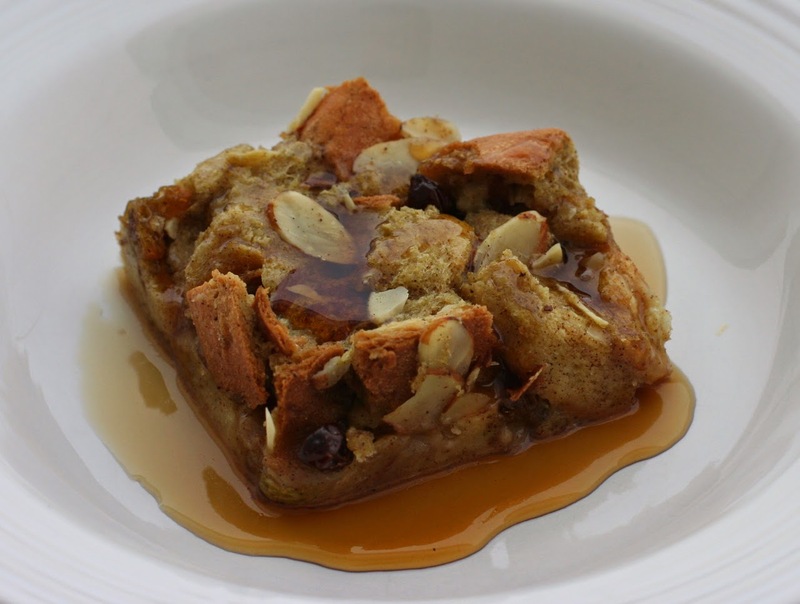 This recipe is a mash-up of Isa's bread pudding from Isa Does It and a recipe from the very first vegetarian cookbook I ever bought, Simple Vegetarian Recipes. I used the all white flour version of my Everyday Bread because it has a nice open crumb structure that easily soaks up the liquid. If you are using a denser or leaner bread, give it more time to soak. I think it's worth the time to use the vanilla bean, but your can sub in 2 tsp vanilla extract and forget heating it on the stove. The agar is probably not needed--I was just panicking that I was adding too much liquid. As written, the end result is a moist and custardy pudding that pairs nicely with the anise notes from the syrup. The almonds provide some texture to make for a perfect dessert. 1. Put bread in a large bowl. Add raisins and almonds and toss to mix. 2. Scrape vanilla bean and whisk into the almond milk in a sauce pan. Whisk in turmeric. Add the bean pod and bring to bubbling over medium heat. Remove from heat and let cool. Remove bean pod. 3. Whisk in coconut milk, then whisk in cornstarch until smooth. Whisk in agar. 4. Whisk in the sugar and spices. Pour mixture over the bread and gently turn to coat. Let sit for 5-10 minutes, or until the bread has soaked up as much liquid as it can. Gently mix the bread halfway through if necessary. Transfer to prepared pan and distribute evenly. 5. Bake for 35 mins, or until golden and the liquid has set. 1. While the pudding is baking, add all ingredients to a small saucepan. Bring to bubbling over medium heat and let bubble away for 10 mins. Remove from heat. Remove spices just before drizzling over the served pieces.